President Rivlin participates in ceremony marking 75th anniversary of the rescue of Danish Jews at the Great Synagogue in Copenhagen. 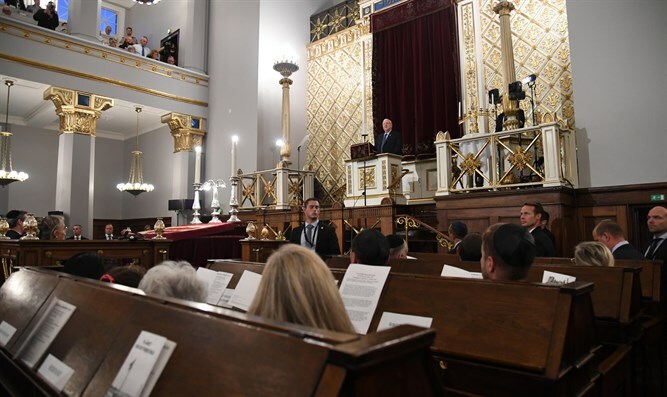 President Reuven Rivlin spoke on Thursday evening at a ceremony marking the 75th anniversary of the rescue of the Jews of Denmark at the Great Synagogue in Copenhagen. The ceremony was attended by Crown Prince Frederik of Denmark, Prime Minister Lars Løkke Rasmussen, president of the World Jewish Congress Ronald Lauder, president of the Jewish community in Denmark Dan Rosenberg Asmussen, Danish Holocaust survivors and members of the Danish Jewish community. During the ceremony, Bent Melchior and Birgit Krasnik Fischermann told the story of the rescue of the Jewish community in October of 1943. The Great Synagogue was attacked some three years ago and this was its reopening after it was restored. Bent Melchior was born in 1929 in the German town of Beuthen to a family with Danish roots. At the age of 14 he returned to Denmark with his family where his father, Rabbi Marcus Melchior, was the Chief Rabbi of the community. In October 1943, his family went into hiding in Denmark and was later smuggled in a fishing boat to Sweden in a 19-hour trip. After the liberation of Denmark in May 1945, the family returned to Denmark where Bent completed his studies. In 1948, he volunteered to serve in the Israel Defense Forces and took part in the War of Independence. His oldest son is former Israeli government minister Michael Melchior. Birgit Krasnik Fischermann was born in Copenhagen in 1938. In 1943, when she was five years old, she and her parents were sent to the Theresienstadt concentration camp and was imprisoned there for a year and a half. Birgit is chair of the Danish Theresienstadt Association.